The Vestry of St. James Episcopal Church in Amesbury is very excited to welcome our new Rector, The Reverend John Satula. Fr. John joined us on Sunday, December 21, 2014 and his formal ceremony of installation “Celebration of New Ministry” was held on May 29, 2015 with Bishop Alan Gates Officiating. Thank you all so much for the tremendously warm welcome you have given me since my arrival in Amesbury, it has been a wonderful blessing! Moving, while fun, can also be stressful and your very warm welcome has made the process all the much easier. I would like to take this opportunity to tell you all a little more about myself. I am fondly referred to as a cradle Episcopalian. I was born on St. Patrick’s Day and grew up in Larchmont, New York, a suburb of NYC. Church has always been an important part of my life. I was very involved in the Church in which I attended growing up, St. John’s in Larchmont. I was a member of the junior choir, I acolyted and participated in youth group. Since I was very young, I have always felt that God was possibly calling me to ordained ministry. This call became increasingly apparent to me during my senior year at Elmira College where I did my undergraduate studies. Although I majored in theatre and history at Elmira, I felt God was calling me to something else. After discussing my thoughts and feelings with Father Donald Matthews, the Rector of the Church I attended while in college, he offered to bring me onto his staff for a year to begin discerning God’s call. I worked at Grace Church the following year after graduating college and I entered seminary in the fall of 2003. I attended The General Theological Seminary in NYC where I earned my Master of Divinity Degree. One requirement at General is to participate in a field placement where Seminarians find a position at a Church during their second and third years. I felt very at home at Christ and St. Stephen’s Church where co-incidently, I happened to have been baptized in 1980. After graduating from General in 2006, I decided I wanted to continue my schooling and pursue a Master of Theology Degree. I attended Duke Divinity School the following fall where I majored in Church History and minored in Biblical Studies and Christian Education. While I was planning to concentrate primarily on the Reformation, I ended up taking a class and falling in love with the Baptismal liturgies and practices of the Early Church. I ended up studying the Sacrament of Baptism in depth and wrote my thesis on the Origins of Anointing at Baptism. During my time at Duke I was Ordained to the Diaconate. 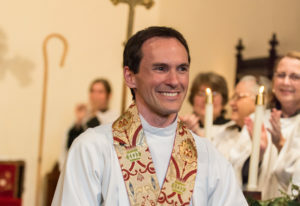 After completing my degree at Duke, I moved to Connecticut where I began my first position as the Assistant Rector of St. Matthew’s Church located in Wilton. After my first four months at St. Matthew’s, I was Ordained to the Priesthood at the Cathedral in Hartford. Since then, I have served parishes in Gainesville, FL and Newtown, CT. I was serving as the Assistant to the Rector in Newtown during the tragic shooting at Sandy Hook Elementary School and we had parishioners who lost a child during this horrific event. Sometimes when events like these happen, questions arise as to why God would allow such an awful event to occur? Where was God in all of this? There was a true sense in the community that God was with us and His presence was very tangible. One way God manifested Himself was by showing us that while we cannot take away the pain of this event we can stand with one another letting each other know we are not alone and offering our support and love and presence to each other, especially to those directly affected by the terrible tragedy of that day. While looking for my next call, I was blessed to come across the opening at St. James the last day the search committee was accepting names. Since the very beginning of this process, I have felt strongly that this is where God is calling me. Our Senior Warden Joan Miller said to me at one point, she thought St. James would be a great place for a first time Rector. I could not agree more and am excited and thrilled to continue my ministry among all of you! I look forward to meeting and getting to know you and to beginning our journey together! Please know that you are all in my daily thoughts and prayers. St. James is a strong and loving community that welcomes, encourages and empowers all to grow in Christ and to do God's work in the world. Visit our church or become a member. Reflections and Sermons from Fr. John. Presiding Bishop Michael B. Curry coming to Massachusetts! Copyright © 2019 St. James Church, Amesbury. All rights reserved.